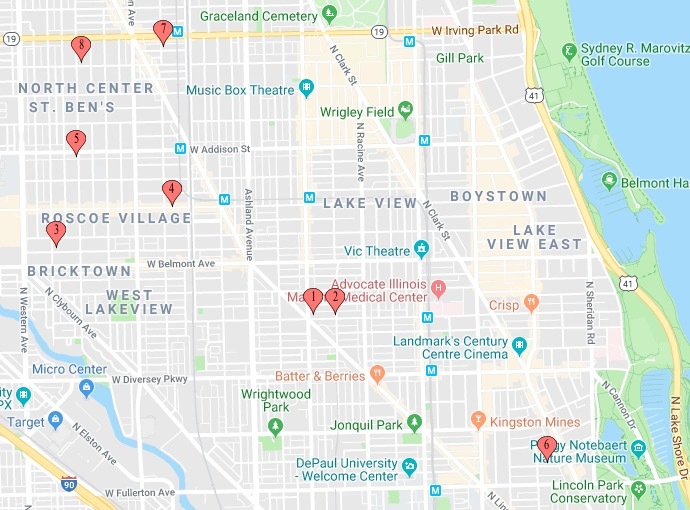 Map showing approximate locations of robberies listed in today's alert. 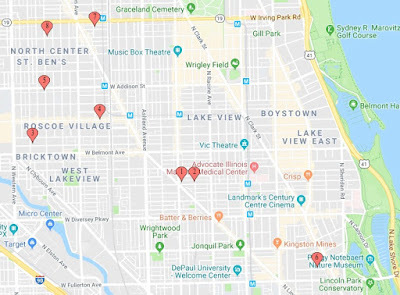 Police today warned residents of the 19th (Town Hall) Police District about a series of hold-ups that have been reported over the past week Lincoln Park, Lakeview, Roscoe Village, and North Center. Community alerts are typically issued when detectives believe a crime pattern is the work of an individual or group of offenders. The warning lists eight robberies between May 14 and May 17 that investigators believe are related. In each case, the offenders have approached victims from behind while they were walking alone on a sidewalk. At least one offender has displayed a handgun in his waistband or put a gun to the victim’s head while demanding valuables. Police said the other offenders either restrain the victim or go through the victim’s pockets in search of phones, wallets, and other property. The robbers are described as three black men between 17- and 30-years-old who stand 5’9” to 6’1” tall. One has worn a red hoodie, another wore a gray hoodie, and the third wore a dark hoodie, police said. In one case, the men were seen leaving the area in a dark Jeep or SUV, according to the alert.